Mattey is definitely gifted in the music department. She doesn't always like to show off her talents though. I wonder who she gets that from? (Totally me.) She has been singing since she could speak in sentences. For her third birthday we got her a karaoke machine. She loved that thing. You can often hear her singing to herself. She's even written a few songs. 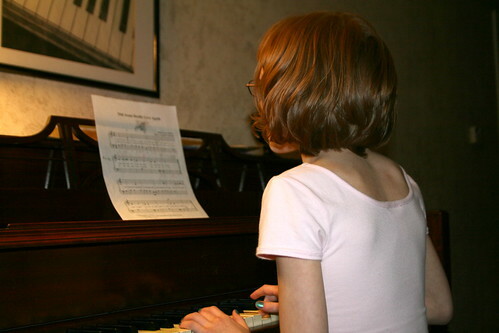 At age 7 & 8 she took piano lessons for a little more than a year but got discouraged because she wasn't playing fun songs and their teacher moved away. This is also a Mattey trait, to get bored or frustrated and give up. (That's me too.) I've let it be for now but I'd love for her to take up the piano again. I'm not going to push it because that will make her run away/fight me more. She did choir at school last semester but decided she didn't like it that much so didn't continue to the end of the year. Today, out of the blue, she asked me where her piano music was. At first I thought this was a stall tactic to get out of unloading the dishwasher but once she found it she actually sat down and played. I couldn't believe it. I was hoping this would happen some day. She even played a song for Family Home Evening. Who knows how long this interest will last. I really enjoy playing for myself and sometimes others so I hope it lasts for years and years. Check out that finger nail polish. It's one of her favorite colors right now. Turquoise.